Notes: Based on the manga by Tezuka Osamu. In the shadows of the world medical community, the unlicensed surgeon Black Jack is rumored to be able to perform medical miracles if only one can find him and afford his fees. The reality of the man is quite a bit different than the rumors suggests. Rather than be fettered down by bureaucracy, he has freed himself from the medical establishment to practice medicine and heal to the best of his ability. Soon the rogue surgeon will find himself drawn into a conspiracy centered around various physical and intellectual geniuses, so-called "super humans" that have been making news for the past few years. I had no particularly strong expectations when I picked up this title. I knew it was based on a manga by the "God/Father Of Manga" Tezuka Osamu but was unsure what to expect. After all, despite Tezuka's reputation, there have been many rather lackluster adaptations of his manga in the past. I also had not read any of the manga nor viewed any of the previous OAV episodes. I am pleased to report that this particular adaptation does justice to Tezuka's legacy rather than detracting from it. Despite my initial skepticism, I quickly found that the plot in this title was a compelling and intrigue filled medical mystery. Excellent pacing and skillful direction helped contribute to the tmosphere of dramatic tension. Despite the fact that epidemiology and surgery aren't perhaps inherently dramatically compelling subjects, I still found myself drawn quickly into the plot which balanced the exploration of the medical issues themselves with their impact on people's lives. These well-handled humanizing elements played a critical role in enhancing the overall drama of the title. 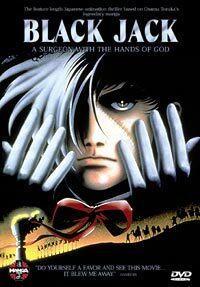 The title's generally well-done character work only serves to get the viewer more interested in the plight of some of the patients and also Black Jack himself. Despite the fact that on the surface he seems a somewhat aloof character, the title does a good job of helping us understand him as a truly dedicated healer and helps bring his personality into focus without his reactions seeming too forced or blatantly expository. The development and handling of the character work for the antagonists was done well and successfully presented them as flawed people who had made some mistakes rather than one-dimensional ruthless monsters. Some of the "super humans" could have been developed a bit more strongly, though in general I think the title did a good job of presenting them more as simply suffering patients. My only strong characterization complaint concerns Black Jack's assistant Pinoko. There are certain aspects of her background that were not really explained in the movie (such as the fact that she is much older than she appears) and would have helped to better clarify why Black Jack deals with her in certain ways and would have lead to slightly less confusion in certain parts. As it is, she serves more as a plot device than an actual character. Despite my personal interest in medical matters, I found that in certain areas they were perhaps a bit too interested in depicting medical procedures in fine detail. While I'm not particularly squeamish myself, I could easily see that some viewers might not find detailed scenes of surgery dramatically necessary or compelling. There are a few aspects of this title that stretch medical plausibility at points but it isn't anything so outrageous that it should particularly damage enjoyment of the title. Some viewers, though, might be disappointed by the way the ending is handled since it does somewhat undercut the careful investigative focus that characterized the rest of the film. In terms of the title's more technical qualities, the artwork and animation is superb. The character and scene design work both demonstrate a solid and unusual attention to detail. I should note that this movie, with the exception of Pinoko, uses updated and realistic character designs that while faithful to the general idea of Tezuka's originals might annoy purists. Honestly, I preferred the newer more realistic character designs in the film. I was a bit confused why they seemingly decided to not update Pinoko's character design. She ends up visually out of place and I found this distracting during the scenes in which she appeared. Recommended Audience: There are several weighty themes about the misuse of science and medicine addressed and there is a conspiracy at the center of this plot and some people are willing to be quite ruthless to preserve their secrets. That violence, though, actually kind of pales in comparison to a lot of the medical gore and other injuries that are shown throughout the show. Generally, I think it is most appropriate for older teens and above.